Sean Dyche admitted his side's performance was a bit flat in defeat at Bournemouth, having hit the 40-point mark last week. There was an end of season feel to proceedings at the Vitality Stadium, but Burnley were unable to add to the seven away points they have accrued all season, as they went down 2-1. Sam Vokes cancelled out a first half goal from former Claret Junior Stanislas, but Josh King snatched a winner seconds after the one-time Bournemouth striker netted his fourth in as many games. Asked whether his side were not quite themselves, Dyche admitted: "Second half in particular, I don't want to be hyper-critical of the players, because they've had some really big games, really important games lately, and to get to that 40-point mark I think was a big sigh of relief as much as anything. "The tension was building, so today there was a flatness to the performance, particularly second half. "We conceded two really poor goals, especially the second - the first one can happen, but the second is a really poor goal. "We for a fine goal ourselves, and Vokesey was excellent again - the two centre forwards for each side, Vokesy and Josh King were probably the best players on the pitch. "I'm disappointed in the end, but over the season it's hard to question this group." 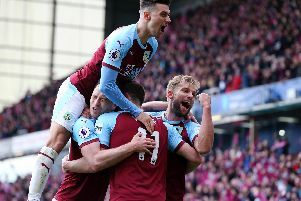 Burnley were again without the injured Ben Mee and Michael Keane, but James Tarkowski and Kevin Long again did well in the circumstances, bar the two goals: "Our two centre halves are earning their spurs at this level, and Longy has come from nowhere, and credit to him physically for playing two back to back games. "But the shape of the back four got lost a couple of times today, which is unusual for us, but it's difficult at the moment to be too critical. "And Eddie (Howe) has got a good side, and for all they played some good stuff, I don't think they really penetrated too much, so I was pleased with that. "We just had two poor moments defensively. "We scored a fine goal and had a couple of moments in the first half, when we had the better edge of the chances - Bournemouth didn't create a lot. "But second half they were the better side and we went a bit flat. "That can happen sometimes, there's been a lot of tension involved, down at Palace, again at home to West Brom, you're 2-1 down and nick a leveller, so over the season the lads have given a lot to the cause. "It was a flat second half without that energy, that real spark to our play, on the back foot, and at this level, if you do that, it's hard to win games. "But we could have seen it out to get a point." Dyche is determined to end on a high at home to West Ham next Sunday: "It looked like 'lets come down here and get the game done', type-thinking, that subliminal 'we've got the job done" type-thinking, and that can work either way - sometimes it gives you a lift, and sometimes you can be a bit flat. "But we have the home game next week and have a chance to sign off the season in a good manner."